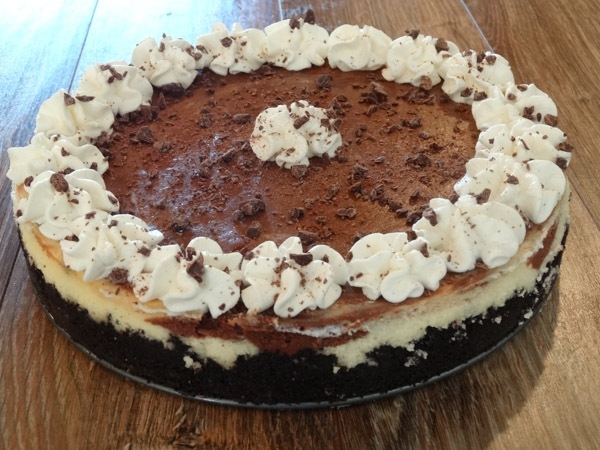 This Chocolate Marbled Cheesecake is a great cheesecake for a special occasion. 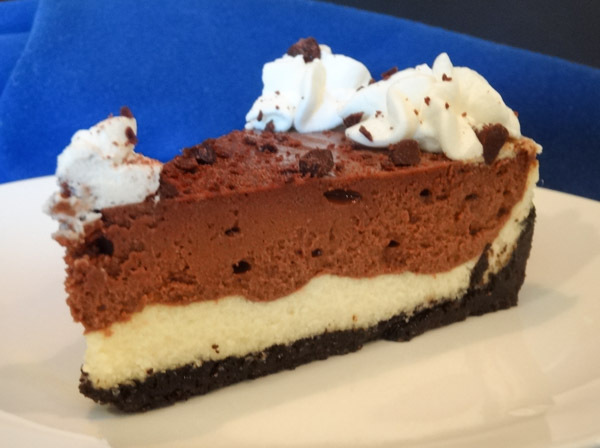 This cheesecake combines the best of both worlds with a classic cheesecake and chocolate cheesecake in this great tasting dessert. There are so many different flavors and options for cheesecakes these days. Sometimes it’s really hard to narrow down a decision to just one. 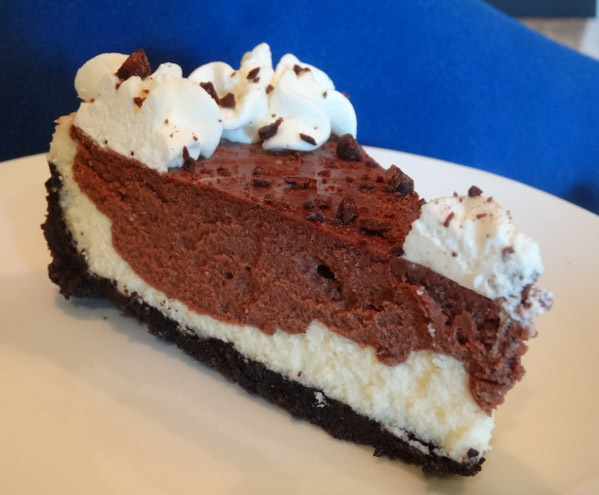 This Chocolate Marbled Cheesecake is great as it lets you enjoy the flavor of a classic cheesecake, as well as the richness and intensity of a chocolate cheesecake. Start off by making the crust. Pulse Oreo cookies in a food processor until finely crumbled. Add to bowl with melted butter and toss with fork until ingredients are well blended. 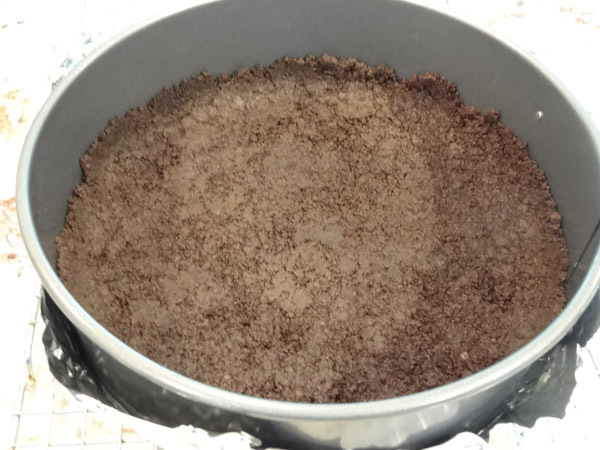 Line bottom of 9 inch springform pan with parchment paper and then press crust mixture into bottom and partially up sides of pan. Wrap outside of springform pan with aluminum foil. 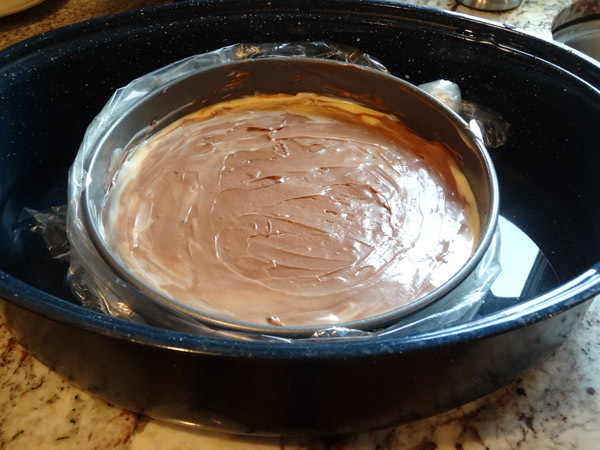 You’ll need the aluminum foil to prepare cheesecake for water bath to ensure even baking and prevent cracks. Some of the butter will also leak out from the crust and the aluminum foil will catch it. Place pan in oven and bake at 350 degrees F for 8 minutes. Remove to wire rack to cool. In large bowl, add in cream cheese and sugar. Blend with electric mixer on medium speed for 2 – 3 minutes. Add in eggs, one at a time, followed by vanilla extract. Blend until well combined. Add in heavy whipping cream and blend until combined. Pour half of the batter into the prepared springform pan. 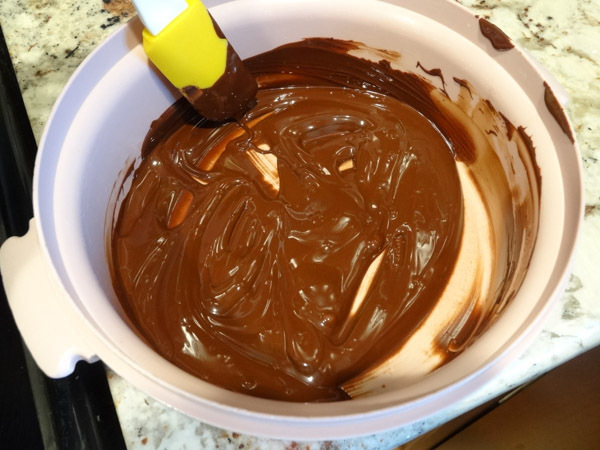 In separate bowl, heat the chocolate in microwave for up to one minute, twenty seconds, stirring at thirty second intervals until chocolate has melted. 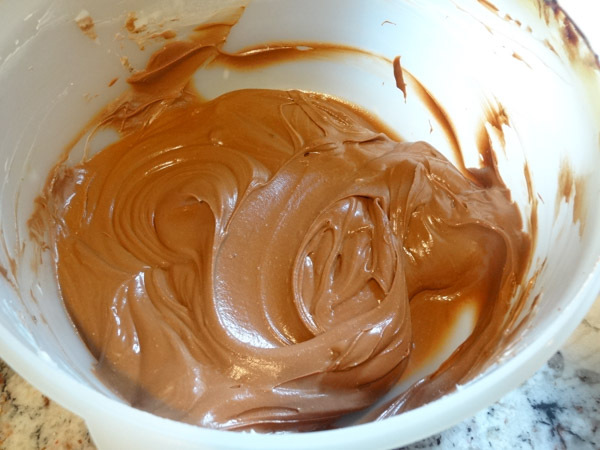 Add melted chocolate to remaining cream cheese mixture. Blend with electric mixer until combined. 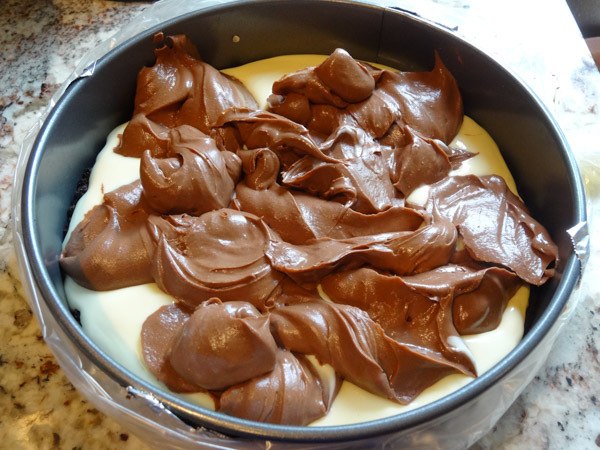 Gently spoon chocolate cheesecake layer on top of regular cheesecake filling. Gently spread out layer with spatula. 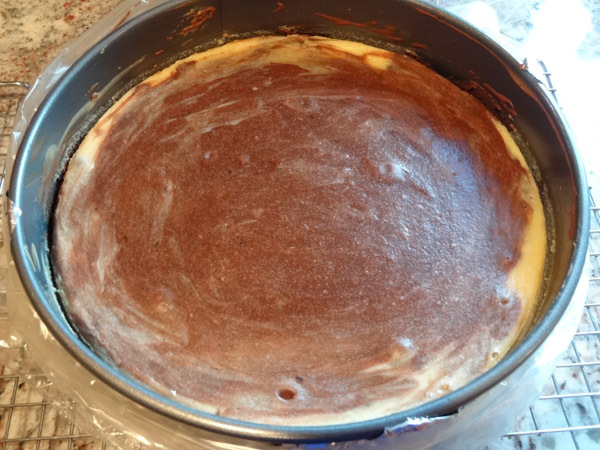 I liked keeping this cheesecake as two distinct layers, but if you want more of a marbled look, this is where you would drag a knife and pull white cheesecake filling over and through chocolate layer. Tip: in addition to wrapping outside of springform pan with aluminum foil, I added a slow cooker liner. This prevents any water from seeping into pan with the water bath. Place springform pan into larger roasting pan and add hot water to roasting pan so that water reaches halfway up side of springform pan. Place pan in oven and bake at 325 degrees F for 45 to 55 minutes. Center of cheesecake should be slightly jiggly. Turn off oven and crack door open. Leave cheesecake in oven for an additional 30 minutes. Let cheesecake cool for an additional 30 minutes on wire rack. Cover top with foil and refrigerate for at least 8 hours. Run knife or spatula around rim of springform pan prior to releasing pan. I decorated the top of this cheesecake with homemade whipped cream and finely chopped semisweet chocolate chips. To make the whipped cream, use a medium sized bowl and add powdered sugar to heavy whipping cream. 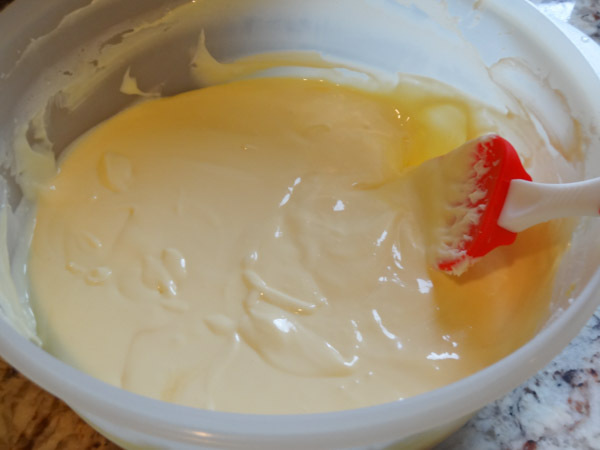 Blend with electric mixer on high speed until stiff peaks form (about 2 – 3 minutes). Place whipped cream into piping bag and decorate with choice of Wilton tip (I used a Wilton 1M). Preheat oven to 350 degrees F. Double wrap outside of 9-inch springform pan with aluminum foil or secure with slow cooker liner. 2. Pulse Oreo cookies in food processor until finely crushed. 3. Add crushed cookies to medium sized bowl with melted butter. Toss with fork until ingredients are moistened. 4. 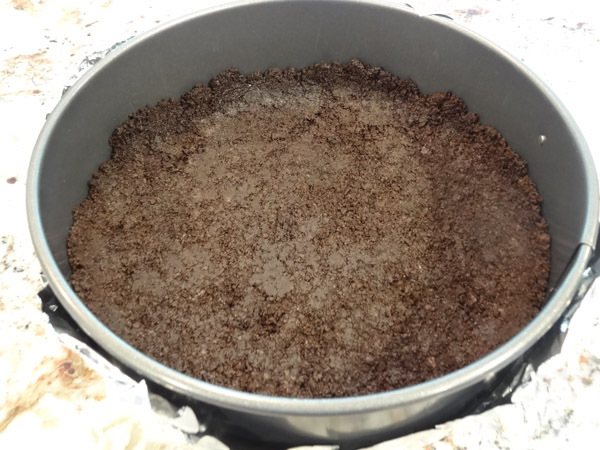 Press cookie crumbs into bottom and partially up sides of springform pan. 5. Bake for 8 minutes. Remove to wire rack to cool. 2. 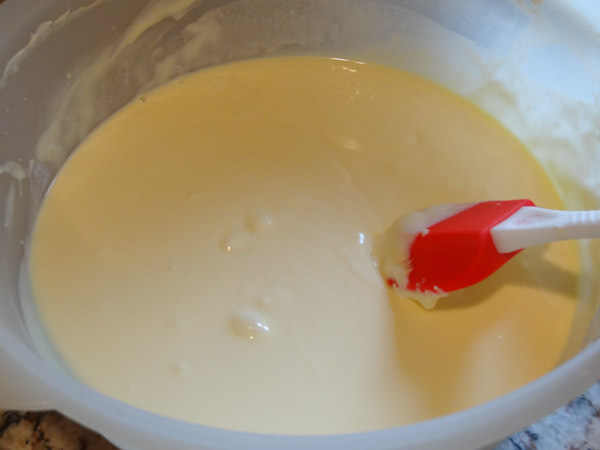 In large bowl, blend the cream cheese and sugar with an electric mixer on medium speed for 2 – 3 minutes. 3. Add in eggs, one at a time, followed by vanilla extract. Blend until well combined. 4. Add in heavy whipping cream and blend until combined. 5. Pour half of batter into springform pan. 6. In separate bowl, heat bittersweet chocolate in microwave for up to one minute, twenty seconds, making sure to stir at thirty second intervals until chocolate has melted. 7. Add melted chocolate to remaining cheesecake batter. Blend with electric mixer until combined. 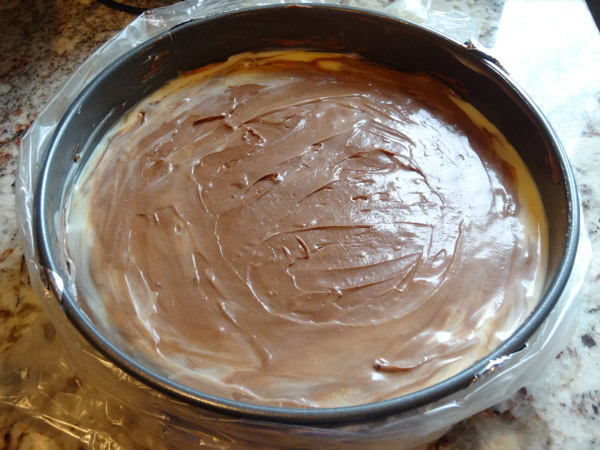 Spoon chocolate cheesecake mixture on top of regular cheesecake layer. Use knife to swirl layers as desired to give marbled look. 8. Place springform pan into larger roasting pan and carefully add one inch hot water to roasting pan. 9. Place roasting pan in oven and bake cheesecake at 325 degrees F for 45 to 55 minutes. Center of cheesecake should be slightly jiggly when done. 10. Turn off oven and crack door open. Leave cheesecake in oven for an additional thirty minutes. 11. Place cheesecake on wire rack and let sit out on counter for an additional thirty minutes. 12. Cover and refrigerate for at least 8 hours. 13. 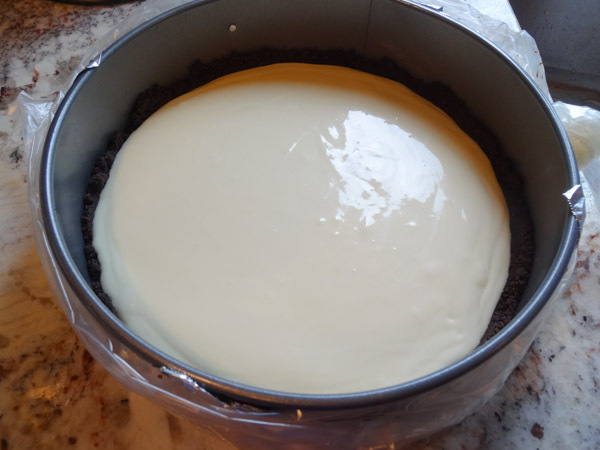 Skim knife around edges of cooled cheesecake before releasing springform pan. In medium-sized glass bowl, add in heavy whipping cream and powdered sugar. 2. 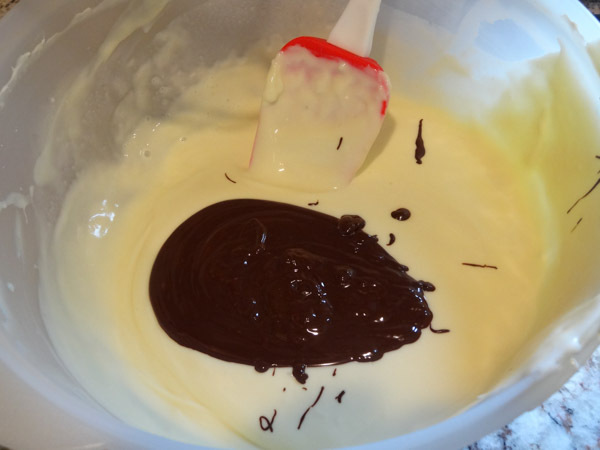 Blend with electric mixer on high speed until soft peaks and then stiff peaks form (approx. 2 – 3 minutes). 3. Place whipped cream into piping bag and decorate edges of cheesecake with choice of Wilton decorating tip. 4. Sprinkle with chopped semisweet chocolate chips for garnish if desired. 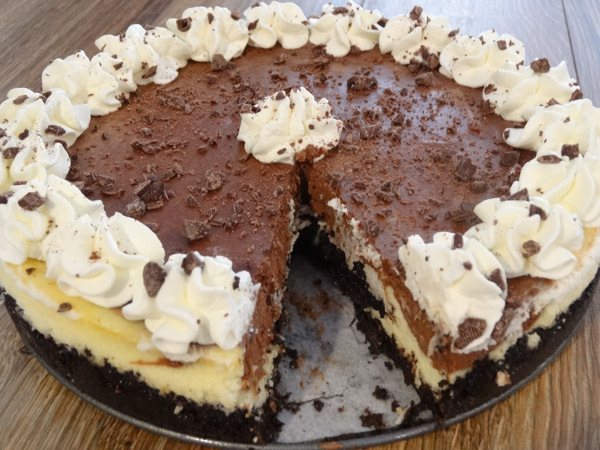 cookies and cream cheesecake and triple chocolate cheesecake .